Developed by ORE, the Noctis was breed from altered copies of the Primae blueprint. ORE is the leading blueprint manipulation facility for specialized industrial class spaceships. They undertook the task of creating a dedicated salvager, large enough for fleet operations in the furthest reaches of space but easy enough for usage in all areas of the Empire. Due the the cannibalistic nature of spaceships, salvaging after hunting fleets is an important area. Before, this was the realm of Destroyers. These ships would descend upon the battlefield and fill their holds with salvaged material and modules. While Destroyer's were first tamed for this task their predatory nature made them harder to control and they did not thrive upon a pure diet of salvage. However, salvaging is such an important part of the spaceship diet that almost every species can be seen with some type of salvager adaptation or fleet following accompaniment. With the advanced speed of spaceship domestication and adaptation for various roles by capsuleers there was a need for a more dedicated salvager. Thus, ORE created the Noctis. Due to its fertile nature this spaceship has expanded across all of known and unknown space in a swift, and overwhelming manner that proves it to be yet another fine decision by ORE.
Of good nature and a calm temperament the Noctis is a gentle giant. It is an easy member to keep with a fleet. 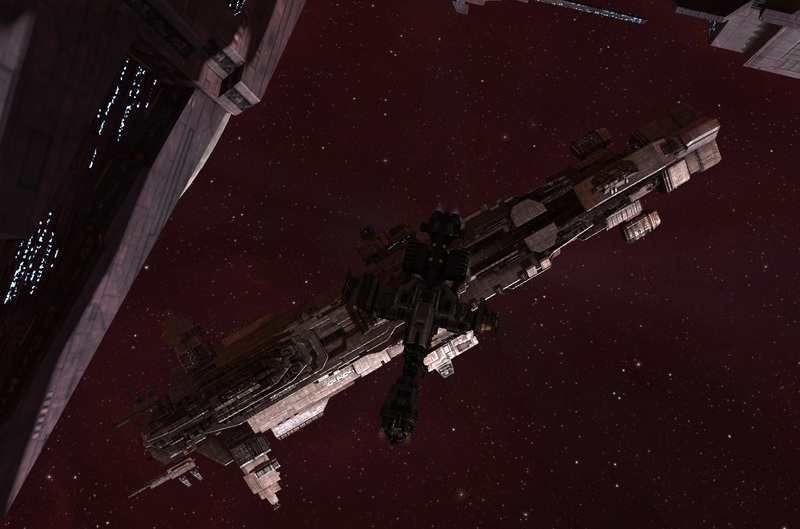 Its gentle nature allows it to reside with both carriers and the larger, ORE created industrial the Rorqual. Rorqual are known for their flighty temperament and the Noctis is often a calming influence upon that massive Industrial. Its ability to feed off of any wreck also makes it an easy keeper in all regions of space. As a created species the Noctis was not breed with defensive measures in mind. The initial expansion across inhabited empire space allowed for this. However, recently, ORE has released a series of modifications for these spaceships allowing them to integrate with a flight of symbiotic drones. ORE initially constructed this adaptation to allow the Noctis to bond with salvage drones. However, it was pointed out by many Noctis owners that it would be a small thing to allow the Noctis the ability to bond with any drone type, allowing it some measure of defense in the border lands. Also, some capsuleers have trained their Noctis to integrate with smartbombs and various offensive devices. The natural defensive mechanism of the Noctis is to shine tractor beams into the eyes of its attacker while simultaneously salvaging from its hull. While the natural self preservation is one of the solid factors to invest in this spaceship, the fact is that the Noctis does not understand that salvagers and tractor beams have no effect upon a living spaceship. I do and then spell checked myself into incorrectness. In the first 'background' paragraph and in the second-to-last paragraph, you used the present tense 'breed' instead of the past tense 'bred' which is more correct. Also, in the last paragraph, I believe you mean 'solid' instead of sold', as the latter makes no sense. Last one is also in the last paragraph, 'affect' isn't correct to use in this instance, 'effect' is better. I also think you mean No 'effect' there. Good fun though! Love reading these, as I've said before.